How do I know which percentage to use? What is the difference in the percentages at the bottom? There are some that say "Unweighted" and some that say "Effect". At the bottom of the Actual Unshaded % column I get an unweighted yearly average (89.19%) and at the bottom of column 2 I get an "Effect:92.41%". I don't understand the difference between these 2 totals. Naturally, I would like to use the higher one for rebate purposes but this column displays sun hours and I need percentages. Do I have to trace on the diagram before I take the photo? Does the Assistant software account for magnetic declination? How do I know what derate to use? How do I take the photo of the Pathfinder for the Assistant software? How is the Azimuth/Altitude data calculated on the Summary Report page? How many analyses do I need to do for each array? How much of the photo should be cropped at the "Cropping Image" page? What is the "Array Configuration" page for? What photo goes at the "Array Configuration" page? Why can't I change my azimuth? I don't see a place to change it. Why doesn't the shading in my photo seem to match the tracing at the bottom of the report? Why is the software asking for a "challenge code"? What information is included in the local weather data? A. As of August 2008, the serial number is on a label on the back of the envelope that the Assistant software came in. For download orders, the serial number will be emailed to you upon completion of the order. The serial number is case sensitive. If you have misplaced your serial number, go to the Lost your serial number? page on our site. Follow the directions and your serial number will be automatically emailed to you. Q. How do I know which percentage to use? A. If you are reporting to an agency for rebates, etc., you need to check with them to see what formula they are requiring. See the definitions for each of the columns at the description window under "Options" / "Report Columns". Q. What is the difference in the percentages at the bottom? There are some that say "Unweighted" and some that say "Effect". At the bottom of the Actual Unshaded % column I get an unweighted yearly average (89.19%) and at the bottom of column 2 I get an "Effect:92.41%". I don't understand the difference between these 2 totals. Naturally, I would like to use the higher one for rebate purposes but this column displays sun hours and I need percentages. A. The "unweighted" columns mean that each month is treated equally. It is what you would get when you averaged the numbers equally on the diagrams. The problem with using that number is that November, December, or January is never "worth" as much as May, June, or July in radiation (in the Northern hemisphere). Therefore 100 percent of January may be equal in radiation to 80 of June, etc. As a general rule, most rebate reporting agencies are looking for the Effect % and/or Sun Hours (the higher percentage). Q. Do I have to trace on the diagram before I take the photo? A. No. You will use the software to "trace" the shading onto your photo. The Assistant report will then be your permanent record for the site. Q. Does the Assistant software account for magnetic declination? A. Yes. The software is working with the reflection itself and not the diagram underneath. When you enter the zip code and set the level and compass for magnetic north/south, the Assistant software knows how much the image needs to be rotated for declination. If the shading in the photo seen at the bottom left of the report doesn’t seem to match the tracing on the diagram on the bottom right of the report, then you accidentally set your declination improperly on the Pathfinder unit itself. The Assistant software will automatically account for declination based on the zip code or latitude/longitude you entered. Q. How do I know what derate to use? A. If you are reporting to an agency for rebates, you need to check with them to see what derate they are requiring. Some states, such as Wisconsin have a set derate of .8. California derates the system for rebate purposes using only the inverter derate. Please check with your reporting agency. If you are using the software to size a system, we recommend that you use the calculate derate option for more accuracy. Q. How do I take the photo of the Pathfinder for the Assistant software? Fill the viewing area of your camera with the Pathfinder without cropping any of the blue (or green) plastic housing. Keep the camera centered above the Pathfinder. The easiest way to check is to make sure that the blue (or green) plastic housing is equi-distant around the lens. The above is a Great Photo because the unit is centered, fills most of the viewing area and the entire unit is in full view. The above is only a Good Photo because the unit should fill more of the viewing area (too far). The above is a Bad Photo because plastic housing is cropped off. You want to fill the viewing area of your camera with the Pathfinder without cropping any of the blue (or green) plastic housing. The above is a Bad Photo because the camera is not centered above the Pathfinder. The easiest way to check is to make sure that the blue (or green) plastic housing is equi-distant around the lens. Q. How is the Azimuth/Altitude data calculated on the Summary Report page? A. The altitude angles are in reference to the shade outline pictured during the site analysis. The Assistant software calculated the angle to the top of the obstruction (shade) object in the specified compass direction. The "angle 1" on the Formula page is an example of the meaning of this angle. Q. How many analyses do I need to do for each array? A. If you are reporting to an agency for rebates, you need to check with them to see what they are requiring. Some states only require 2, one at each of the bottom corners. California requires an analysis at "all major corners". Q. How much of the photo should be cropped at the "Cropping Image" page? A. "Click and drag" each of the 4 handles at the sides until the side touches the outside edge of the plastic housing of the dome section in the photo. See the example to the left of the page in the program. Q. What is the "Array Configuration" page for? The above is a Sample Page of report of System Picture Layout. This array configuration is for a "four-corner" analysis where the software will average the 4 pictures taken at the 4 places indicated. Q. What photo goes at the "Array Configuration" page? A. The Array Configuration page allows you to enter a photo of the roof where the future arrays will be installed. Once you have loaded a photo of the roof, you may choose how many analyses you will be making on the roof top: one, four, or a custom number. The numbers below your photo can then be dragged onto the photo to show where you took the analysis for the array. These numbers will correspond with the different tracings/photos of the dome you will import in the next section of the program. Q. 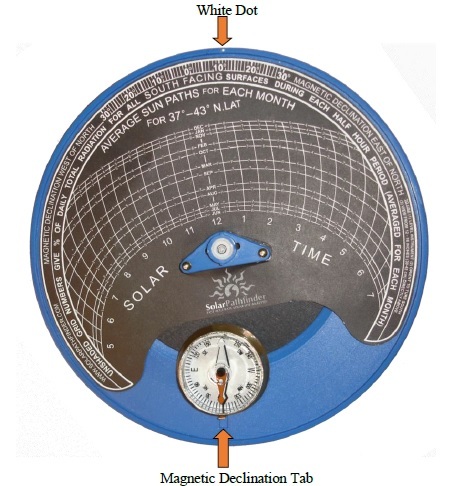 Why can't I change my azimuth? I don't see a place to change it. A. More than likely the settings on your monitor have been altered, making the font/text too large (shoving part of the analysis settings off the page where you can't see them). Go to: Start / Control Panel / Display / "Settings" tab — both the screen resolution and the color quality should be at their highest settings. Hit "Apply"; then "OK". Q. Why doesn't the shading in my photo seem to match the tracing at the bottom of the report? A. The Assistant software will automatically account for declination based on the zip code or latitude/longitude you entered. If the shading in the photo seen at the bottom left of the report doesn't seem to match the tracing on the diagram on the bottom right of the report, then you accidentally set your declination improperly on the Pathfinder unit itself. Q. Why is the software asking for a "challenge code"? A. The "challenge code" is our "back-up" system for licensing. You need to have internet access during the initial licensing process. If you are on the internet and are still getting this message, you are probably on a network and will need to get your IT person to allow the software have temporary access to the internet for registration. Q. What information is included in the local weather data? A. 1) We use TMY2 data which is a statistical data base of "typical" hourly weather data for an entire year. The "typical year" represents data gleaned from 30 years of weather data. It implicitly includes cloud cover data as part of the radiation data.